It is safe to say that the Rangers are now entrenched in the inevitable winter doldrums. The Blueshirts put together their third straight poor performance when they took the ice in Pittsburgh on Tuesday and lost to the Penguins 2-0. Yet again the power play pissed passed away chance after chance. The Rangers aren't desperate to add scorers, they are desperate to have their own scorers start scoring. Gabby has one power play goal in his last 12 games and two in his last 28. Brad Richards doesn't have any in his last 31 games, with just four assists during that span. Arty Anisimov, 30 games no ppgs. Derek Stepan, none in 45. This is simply unacceptable. *Reason why the Nash rumours are nothing more than rumours? If Dubi was to be included then he would be showcased. Instead he was saddled with John Mitchell and Mike Rupp. The kid is not being used is a position where he can succeed, so it is of little wonder that he is left wandering out there. He is definitely trying his hardest - can't take anything away from his effort - but all the forechecking in the world is useless if there is no one out there to take advantage of it. *Why was Rupp playing? He contributes absolutely nothing whatsoever to the roster. The Rangers were desperate for a spark and not only did he not fight anyone, he didn't even hit anyone. Not one recorded hit in six minutes of ice time. *Stu Bickel at least tried to mix things up but he looked very much like a dog who realizes he is on a short leash. Amazing that he actually went to the Pittsburgh crease and planted himself there - something no other Ranger was willing to do - and it was on a shift where he was supposed to be a defenseman, so he got reamed out for it. Funny to see Boyle, who had to cover for him at the point, go up and say something when he doesn't have the nerve to take the abuse and use his size to help the team. *Dan Girardi was the All Star but Ryan McDonagh has been equally as good, and on this night he was better. McD was great defensively and a post away from getting the Rangers into the game. *Penguin fans are going to point to Malkin's goal and assist as reasons for his candidacy for Hart Trophy. But the other three Pens lines still controlled action. Without Henrik Lundqvist, Pittsburgh wins this one by six or seven - easily. Malkin was stellar, to be sure, but his team could very well have won without him. *I'm proud to say I learned a lot about hockey from watch MSG broadcasts with John Davidson ... which makes me sad to think kids are learning from Joe Micheletti. *Last wrap I pointed out that Eminger and Stralman don't belong starting in the NHL, and they both proved it on this night. Please Mike Sauer, get well soon! Either that or Sather should try to get Greg Zanon or Shane O'Brien for low level picks. *Still think Sammy Pahlsson would be a huge upgrade over Boyle and Mitchell. *Is it a French-Canadian goaltender thing to try to win an Academy Award while playing hockey? Marc-Andre Fleury gave Patrick Roy a run for making easy saves look difficult, and he pulled a very Mmmmaaarrrttyyy-esque dive to draw a penalty. *Yet another game where the Rangers clearly could have used Sean Avery. Long stretches where they were lifeless and pinned in their own zone. Antics aside, Avery's speed and forechecking ability could have been a big help. *Del Zastrous. 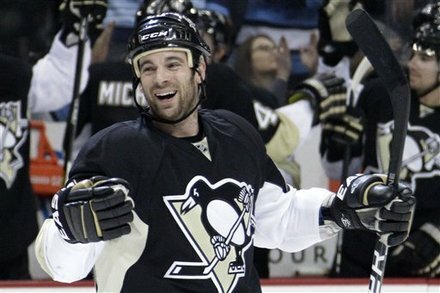 Shocked he wasn't given a second assist on the Malkin goal. *Steve Sullivan's story should be bought by a Hollywood agent. It really is amazing and it really is unfortunate that this good chapter is being played in Pittsburgh. 3-Steve Sullivan - one goal. 1-Marc-Andre Fleury - 27 saves. 3-Hank - The King made some big stops. He could hardly be faulted for the Sullivan goal and the Malkin tally was All-World. 2-Fleury - Antics aside, he made all the saves he had to. 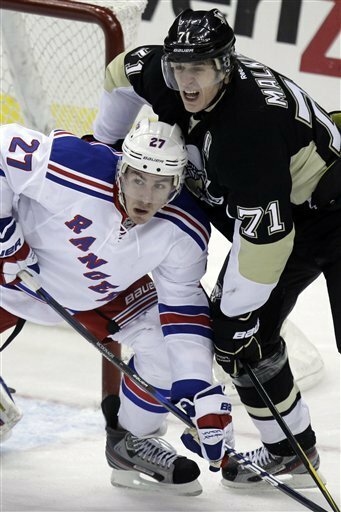 1-Malkin - The Penguins best player completely outclassed the Rangers best players.